My name is Krista Olley and I own The Biscuit Shop Company. This is a real dream come true! I started my adventure with this business in October of 2017. I have always dreamed of owning my own food establishment. To cook has always been my own personal therapy; it’s where I find peace and happiness. I have been hands on cooking and baking from an early age. I remember watching my grandmother from an old ivory counter-top by her stove. The first thing she ever taught me to make was biscuits! I was raised on a farm where I was taught work ethic and values. My fondest memories from my childhood is on that small farm watching my grandfather herd the cows in the early morning dew, as well as picking corn alongside my father and brother. I moved away from the farm in 1990 to further my career as a Respiratory Tech. While in Alabama, I became a mom and decided to end that path in my life to become a stay-at-home mother. Once my daughter was older and I felt I had given her enough knowledge to go out into the world, I began working again starting in 2009. With all of the moves and the years flying by, I seemed to hold onto my passion for cooking, utilizing it in homemade meals. After many years of working in Alabama, something wonderful happened; I bought The Biscuit Shop, and was able to move back to my family’s farm. This also gave me the opportunity to spend more time with my parents, I simply could not pass it up! After a year of baking biscuits, I still seem to fall more in love with the business as the days go by. I am ALL IN and going strong! 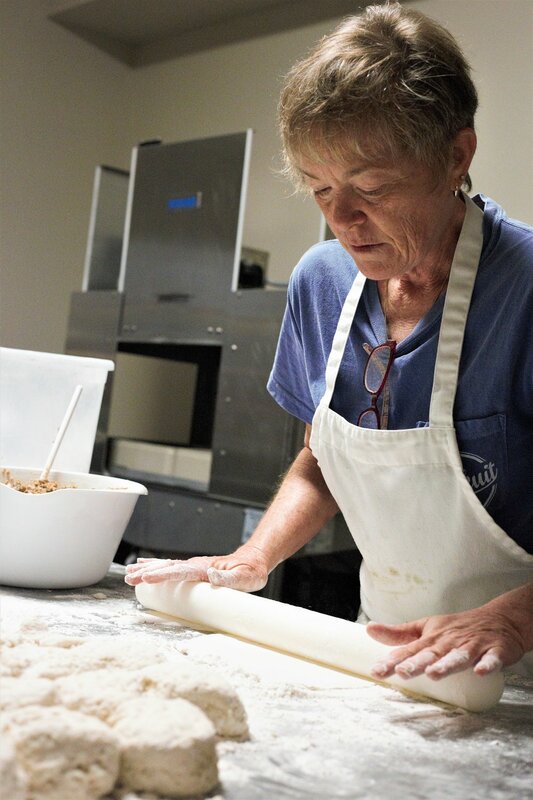 It makes my heart warm every time i see a smiling face due to my homemade biscuits. Through many suggestions from peers, customers, and the age-old recipe book in my head, I have further extended our flavors to over 90. We have original scratch-made Buttermilk all the way to Jalapeno Popper and Cookies and Cream Rolls! The flavors to try are endless, and a MAJOR comfort food. I am continuously working to get my biscuits to everyone! I want The Biscuit Shop to grow around the nation one day! They’ve always told me, “Go big or go home”. Well, I am definitely going big and refusing to go home! I have learned that the key to success is hard work, dedication, determination, and persistence. With this, I strive to make each individual customer happy through good, southern baking. I want to say a special thank you to my family and friends for the encouragement and help along the way. I would also like to say a BIG thank you to all of my customers for making this dream a reality for me. For if not for my customers, new and returning, there would be no Biscuit Shop Company.